As a new homeowner, or even experienced, it can be tricky recognising telltale signs that indicate a problem with your plumbing system. Some warning signs are considerably more visible and easy to notice than others, which makes it hard to understand when it’s time to enlist the expert advice of a professional plumber. To ensure that your water and heating system remains intact and to avoid serious, costly repairs in the future, we have devised a list of the top ten common plumbing issues and how to detect them. There are many different plumbing problems within the home that can be solved through a little DIY and elbow grease. When moving into your first home, it is important to invest in essential plumbing tools to use in the event of an emergency. Tools such as a plunger, pipe wrench, seal tape and set of screwdrivers are all ‘must-haves’ to keep tucked away in your garage or under the sink for the future. If over time, you begin to notice an unusual rise in your water bills, then it is most definitely worth investigating whether the case is an internal fault. 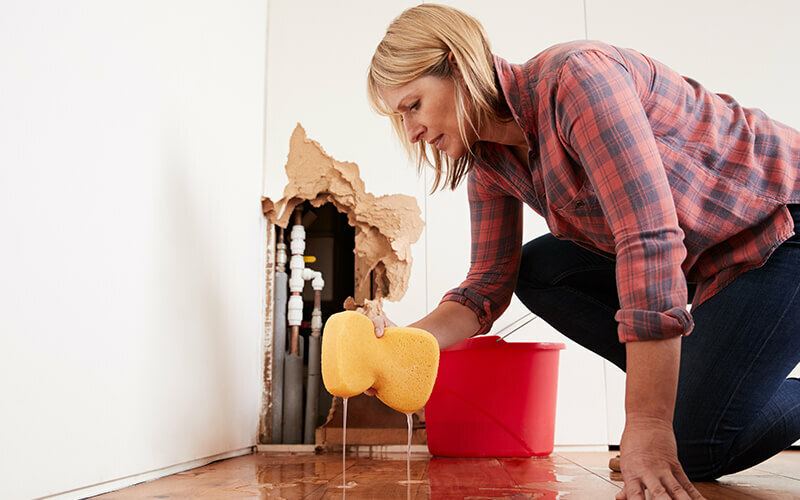 Various different plumbing issues can quickly start to have an impact on the price of your bills such as a leaking toilet, dripping faucet or leaking pipes; all of which we will explain in detail within the next few paragraphs. Remember always to take into consideration the time of year when contemplating the reasoning behind a high water bill. During the Summer, there is always a slight increase, especially if you are a keen gardener and use a sprinkler or hosepipe to water your garden. Similarly, over the Christmas period, if you have regular visitors and guests staying at your home, additional water will be used for showering, drinking, eating, flushing the toilet, etc. Strange noises coming from your pipes or drain is one of the easiest ways to tell that there is a problem brewing. There are five different types of sounds you may hear: banging, humming, gurgling, ratting and whistling. Banging noises occur when there is an issue with the water pressure either due to trapped air bubbles or water hammers. If you notice the sound only when you turn on the faucet, then it is likely to be air bubbles; however, a water hammer will cause noise when you turn the faucet off. Humming noises are a good indication that you have your water pressure higher than your system can handle, meaning that your pipes will begin to vibrate and cause a noise. Luckily, this is an issue that you are likely to be able to solve independently by making a few adjustments. Gurgling is one of the most common unusual noises to hear when draining water and is due to a blocked pipe. There are tonnes of culprits for blocking pipes from soap to hair; it will just take some drain un-blocker, a plunger and some elbow grease to clear. For a guide to successfully clearing blocked pipes, take a look at the B&Q website. Rattling pipes will require the help of a professional plumber to solve, as it is a problem that is hidden behind walls, ceilings or floors. We have many clients who call our plumbers Milton Keynes to solve rattling pipes, and although it is easy to solve, cannot be done alone. A rattling noise is simply due to a fastener, securing pipes to the surface becoming loose or falling off. Lastly, a whistling noise comes with age when particular components start to wear out, meaning that the faucets or valves are unable to function efficiently. As mentioned above, a common plumbing related problem is blocked pipes. These not only cause a gurgling noise, but make it harder for water to drain after, for example, a bath. The extent of the blockage differs between a partial and complete clog. Although a plunger can help to loosen up the blockage and make it easier to flush through, it is incapable of removing it altogether; you will also need to use a drain cleaner afterwards. There are many different tips that can help to avoid pipe blockages, the main of which is to invest into a sink strainer, which will collect all dirt, debris and hair, only allowing water to filter through. Always ensure that a strainer is used in the bath or shower, along with the kitchen sink. Also, when it comes to disposing of oil after cooking, do not pour it down the sink. Instead, use a jar or disposable coffee cup to store all old oil, which can then be taken to your nearest waste recycling centre. Every few months, spend some time inspecting the condition of your pipes. Take a look under kitchen and bathroom cabinets for any signs of pipe corrosion and rust on the outside of pipes. Corrosion is a key sign of a water leak, which means if left unfixed, can begin to damage the floor and any surrounding surfaces. Many different factors contribute towards a corroded pipe including oxygen in the water. Oxygen is known for, over time, causing the metal to rust and it means that impurities will start to build in the water, eventually creating a blockage. Another cause of rust is when the pipe is continuously holding water with a low pH. Although this problem is only common in copper piping, a low pH, similarly to oxygen, eats away at the protective layer of the pipe, making it easy for rust to form. Although the term ‘water pressure’ seems relatively complex, it actually simply relates to how fast the water comes out of the tap. If you notice that instead of a steady flow of water, droplets are just trickling out, it means that you have low water pressure. It is essential to ensure that you check all taps in the house before determining whether you have low water pressure. One by one, run water, both hot and cold, in each room to identify whether the problem is only in a particular location or in all rooms. If there is only an issue when running hot water, it is likely to be a fault in your water heater rather than the pipework itself. In some cases, when the low water pressure is only apparent in particular rooms rather than all, it is likely to be caused by a clogged faucet. This is something that you can solve through removing the faucet and cleaning out the aerator through soaking it in a combination of water and vinegar. Once re-assembled, if there is still a low water pressure, then you will need to purchase a replacement aerator. Dripping faucets can be incredibly annoying, especially when you are trying to fall asleep at night and all you can hear is a constant dripping noise. No matter how tight you secure the faucet, it does not seem to work, which also means that you are continuously wasting water, therefore increasing water bills. Solving the issue of a dripping faucet is, again, relatively simple and is commonly caused by a damaged washer caused by wear and tear. Washers are a vital component in all taps and essentially stop water from being able to push itself out when turned off. Most washers are made from rubber or silicone, which means that, with age, they quickly become either stiff, dislodged or start to tear. This allows even the smallest trickle of water to seep through the tap, which is what causes a constant drip. A leaking pipe is the most costly of all plumbing problems as the pipe will have to be replaced to solve the issue. There are temporary repairs you can make such as fitting compounds, but ultimately, eventually, you will need a professional plumber to replace pipework on your behalf. Avoiding a leaking pipe can be quite tricky as some of the most common causes are things such as cracking, excess water pressure and corrosion, which are often unnoticeable until the damage has already been done. Leaks are easily noticeable because you will immediately be able to spot a puddle under your pipe or there will be dampness under your sink. Water pipes often burst and cause a leak during the Winter due to freezing temperatures. During the colder months, the water will begin to expand as it freezes, increasing the pressure within the pipe. Over time, the pressure will worsen causing the pipe to rupture. Frozen pipes, luckily, can be avoided through correctly insulating the pipes and water tanks. For more information on avoiding frozen pipes, head over to SSE. Mould is caused by a build-up of excess moisture and condensation; it is a good indication of a plumbing leak. Although mould can be unsightly, causing green and brown spots to appear across walls, it can also be incredibly harmful to your health. Consistently inhaling mould spores can have a negative impact on the respiratory system and starts to inflame the airways. Short term exposure to mould will cause coughing, tightness of the chest, wheezing and throat irritation. Whereas, long-term exposure will make it harder for your lungs to function effectively, eventually causing health problems like asthma. The pungent smell of a blocked drain is unmistakable and can be spotted from anywhere, so is most definitely not a scent you want in the home. One of the most common causes of a blocked drain, as unappealing as it sounds, is trapped food. Trapped food will begin to rot as it decomposes, therefore, causing a bad odour. If you do notice that your drains have become blocked due to excess food, it is easy to resolve. All you will need to do is fill your sink with hot water and bleach, then allow the mixture to drain through the pipes until the food is loosened. If after you flush the toilet, there is a continuous flow of water trickling down, then it is more than likely that you have a running toilet. A running toilet can become just as annoying as a dripping tap and means that you will have to replace some inner components. Toilets often start to run due to a problem with the flapper valve. The flapper valve allows water to pass from the water tank to the bowl and when imbalanced or loose, is incapable of stopping the water from flowing. Through regular maintenance and taking time to research and understand the different potential problems your water system may have, you can significantly reduce the likelihood of an expensive fault. Always keep an eye out for any changes in your plumbing and ensure that you investigate the problem as soon as it becomes noticeable. The longer you leave an issue unresolved, the more serious it will become! Previous PostEssential Gas Boiler Safety TipsNext PostWe Are Worcester Accredited Installers!